Manhattan, NY, April 03, 2019 --(PR.com)-- As North Americans get ready for winter to melt away, the Southern Hemisphere is looking forward to its most beautiful season - autumn. While summertime in the Patagonia region of Chile, which runs November to early March, is the most popular time to visit thanks to warm temperatures, the most beautiful time is actually the fall - mid-March through April and May. This season is explosive with brilliant autumnal arboreal hues, from crimsons and yellows to chocolates and burnt oranges, made all that more mesmerizing when framed by the towering snow-capped peaks of Torres del Paine National Park. Visitors to Chilean Patagonia in autumn will experience surprising landscapes -and a surprising lack of other tourists. 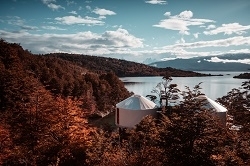 Autumn is one of the best times to plan a stay at Patagonia Camp, Chile's premier luxury glamping experience at the doorstep of Torres del Paine National Park. During the autumn shoulder season, hotel rates are at their most optimal, while crowds are at a minimum. Temperatures run cooler, around 40 to 50 degrees, but still far from the chilly winter weather. Spend a day with the mountains, fjords, meadows and rivers as your private, personal playground before returning to the cozy warmth of one of 20 luxury yurts that overlook the famous Paine Massif. Photographers, too, will love Chilean Patagonia come autumn, especially with the change in light. At this time of year, sunlight shifts to cast a paler glow, giving the region the sense of perpetual dawn. Photographers and photographers-in-training know the importance of morning light, which is why it’s a dream come true to get behind the camera during the fall, especially for photographing wildlife, which is at its peak in autumn. Patagonia Camp offers a Portraits of Patagonia program designed specifically for photographers. This package takes guests to some of the most impressive landscapes in the region, where photographers will have the opportunity to shoot flora, fauna and remarkable, unique landscape shots in the wild. The change in seasons is visible not only on land each autumn, but on local lakes, as well. Fall is the time of year when the lakes of Chilean Patagonia begin to gradually freeze, making iceberg exploration possible. Explore these natural frozen behemoths on foot and get lost in a world of organic ice sculptures, especially within Torres del Paine National Park. Patagonia Camp offers a wonderful opportunity to take in these glaciers by water on Grey Lake, one of the most captivating places in Torres del Paine. The route plied by tour boats allows visitors to appreciate a unique landscape combining backdrops of vegetation, mountains and icebergs. Travelers will be mesmerized by the towering cliffs and dazzling blue tones of ancient Grey Glacier. Outdoor adventurists will enjoy perfect weather for exploring Patagonia’s natural scenery during autumn, as well. Kayaking and trekking are at their best in this part of the world during the fall months. At Patagonia Camp, there are a range of trekking options that range from easy to high difficulty, so everyone from novices to the most experienced trekkers can make the most out of the landscape. Or experience the treasures of Patagonia Camp from the water. The camp's team of guides gives travelers instructions on basic paddling techniques before hitting the shores of Lago Toro, the largest lake in the region. Paddle around protected bays and islets, paired with the extraordinary view of the surrounding landscape. The fact of the matter is that there is no wrong time to visit Chilean Patagonia. Each season provides its own trove of natural treasures. Autumn is no exception and, in fact, is one of the most naturally stunning and crowd-free times to immerse oneself in this breathtaking part of the world.